Using flexographic or digital printing presses, Weber can produce eye-catching primary package labels quickly and economically. Show-off your brand with unique and colorful labels to separate your products from the competition. 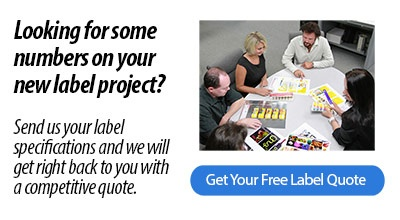 • At Weber, we can print labels in up to ten colors, including process color with exceptional photographic quality. • We offer a wide selection of prime label facestocks, adhesives, and topcoats to create the perfect prime label for your product. • Thousands of die shapes and various label constructions expand your decorative design opportunities. We can create a label using your artwork, or our Graphics Department can work with you to create a new design. • Weber's prime labels can be specially designed to survive extreme cold or heat, moisture, curved substrates, and many other difficult conditions. • Areas on your label can be left blank allowing you to print variable information like ingredients, nutrition facts, bar codes and more. 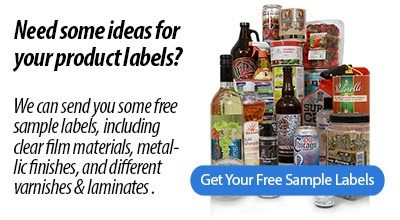 Weber can provide you with a selection of label facestocks to solve virtually any labeling application. Each facestock features certain characteristics for superior performance in specific work environments. • Metalized Paper - This paper features superior print quality and dazzling color in gold or silver. • Rotogloss - Shiny, cast-coated premium white paper. High-gloss finish renders bright and vivid definition of color. • Semigloss - Cast-coated premium white paper slightly less reflective than Rotogloss. 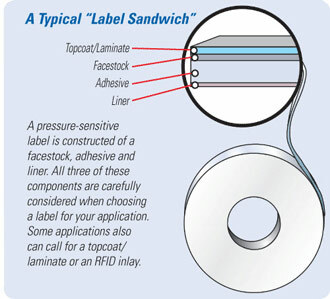 • Flexclear Gloss - Clear gloss film suited to prime labeling where the "no label" look is desired. Very durable and moisture-resistant. • Flex-Lyte - Remarkably flexible, durable white film with a high-gloss finish that is ideally suited to multi-color printing; also available in a matte finish. Great for thermal-transfer imprinting, as well, and excellent for applications where a label needs to be recycled with stretchwrap. Pressure-sensitive adhesive works not only due to its initial tack, but also its slight absorption into the surface of the label substrate. Because the specific characteristics of different substrates can prevent the absorption of adhesive and therefore weaken its adhesion, it is important to consider the substrate material and texture, its shape and its temperature at application. Rubber-based adhesives typically are more economical than others, but lack extreme cold-temperature-resistant qualities. • 155 Performance Permanent - Permanent, rubber-based adhesive used on corrugated, metal, glass, plastic, wood, and many other surfaces. Excellent on polyethylene films. The ultimate in quick-stick properties. • 175 Economy Permanent - Permanent, rubber-based adhesive ideal for corrugated and other packaging applications. • 355 Cold Temperature Permanent - Permanent rubber-based adhesive that adheres strongly to steel, fiber, and plastic drums. Ideal for chemical drum applications. • 375 Broad Temperature Permanent - Permanent, rubber-based adhesive with a wide temperature range. • 655 Specialty Permanent - Features a high degree of initial tack and ultimate removability from painted steel or high and low surface energy plastics. Acrylic-based adhesives have a lower degree of initial tack than their rubber-based counterparts; however, after 24 hours they generally are as permanent as rubber-based. In addition, acrylics resist both low and high temperatures. • 125 Economy Permanent Acrylic - Permanent, all-purpose acrylic adhesive that adheres to a variety of surfaces, particularly corrugated and packaging films. • 425 Performance Permanent Acrylic - All-weather, acrylic emulsion adhesive that excels in flash freeze, frozen, and cold temperature applications. Adheres to many more shapes and surfaces than conventional adhesives. Extremely stable. • 430 Standard Permanent Acrylic - Permanent, acrylic-based adhesive that displays excellent adhesion to a variety of surfaces including corrugated, plastic, metal, and glass. Features a high degree of initial tack and long- term bond strength. • 475 All-Purpose Acrylic - Permanent, all-purpose acrylic that offers a high degree of initial tack, ultimate bond strength and excellent UV resistance; ideal for outdoor use. • 3000 Outdoor Permanent Acrylic - High tack, acrylic adhesive used primarily for outdoor drum labeling applications. The best acrylic for quick-stick applications. • 500 Removable - Durable adhesives which provide long-lasting bond strength, yet can be removed cleanly from a wide variety of surfaces—including glass, metal, wood, plastic, and corrugated. • 600 Opaque - Permanent, pressure-sensitive adhesives tinted black with strong initial tack to corrugated surfaces. Ideal for covering existing labels to block-out fixed information. • 2000 Repositionable - Unique acrylic adhesive developed so labels can be removed cleanly and re-adhered to virtually all smooth, flat surfaces while retaining superb bonding strength. • Ultraplate Select and Plus - High-performance, permanent acrylic adhesive that adheres well to aluminum, painted metal, steel, plastic, polypropylene, polyethylene, and polyvinyl chloride. Offers high degree of tack and ultimate bond strength; shows superior versatility for durable nameplate applications. Our special manufacturing capabilities and broad selection of matte and gloss varnish coatings and laminates help improve the appearance and long-lasting performance of your labels. • UV Matte or Gloss Coating - Ultraviolet-cured varnish that features a high-gloss appearance. It highlights label graphics and protects labels from minor abrasion, moisture and various solvents. • UV Thermal-Transfer-Imprintable Coating - Available in both gloss and matte finishes to protect the label facestock and all custom-printed graphics. • Matte & Gloss Laminates - To dramatically increase the strength and durability of your labels, we offer a variety of polyester and polypropylene film laminates that provide the ultimate in label protection. These are available in thermal-transfer-imprintable or non-imprintable varieties. Why your hot sauce is the secret ingredient.